Welcome to Erk FM: Australia episode 446. Erk is still recovering from what he is calling a unicorn bite. This episode was originally recorded as Erk FM episode 35 in September 2009. For something different, Erk started what he called the 2009 Erk FM Musical United Nations Tour opening in Australia. It was a different way to present a series of episodes – it was made to sound like a concert rather than an episode of a music podcast. All music for the tour supplied by Jamendo. Theme music for this tour series is “Around the World” by Natalie Brown (extracts used with permission). You can hear the song in full on episode 34 of Erk FM. Ambient noise obtained from The Free Sound Project. Concert tickets from Concert Ticket Maker. Welcome to a Erk FM: Australia episode 444. Erk is in severe pain due to a leg infection so is not in a position to produce a full episode of Erk FM: Australia this week. 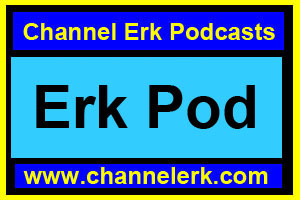 You will hear what was originally Erk FM episode 46 from November 2009 where the episode was programmed by Will Alexander from Queensland promoters Heapsaflash. Welcome to episode 394 of Erk Pod. Erk is now back from his trip to America & Mexico from mid January to the end of February. During this trip, he recorded Erk Pod content but unlike previous years, he did not edit and release Erk Pod episodes on location. For those following along on Twitter and Facebook, however, there was another way that Erk enabled you to hear what was going on fairly close to real time. Using an iPhone/iPad application called Audioboo, Erk recorded short snippets (up to 5 minutes in duration) from various locations & then uploaded them to the interweb as time/interweb permitted. The first few episodes (including this episode) after Erk’s return are the Audioboo messages put together. After all of the Audioboo messages have been put together, regular Erk Pod episodes from on location give more detail & different content to the Audioboo messages. This is the final series of Audioboo message based episodes. Next episode returns to the usual Erk Pod on location format.